You may be surprised to hear that dental technology has dramatically changed the way we care for teeth in the last decade. Innovative tools make it possible for us to show patients their smiles from the dentist’s perspective, capture impressions of teeth without having patients bite down on a mound of putty, and detect areas that are at-risk for tooth decay before cavities ever form. All of these services are so seamlessly integrated into the way we care for our patients that you may not have noticed the difference. Contact our Allentown dental team to find out more or schedule an appointment today. Have you ever heard the saying, a picture is worth a thousand words? Our team couldn’t agree more. In fact, we have a similar saying in our office, the more we show the more they know! We use the Digidoc intraoral photography system to show patients areas for concern, the state of past restorations, and we use images of patients’ teeth to more clearly explain possible treatment options. We’re also able to zoom in, color code, and otherwise enhance these images to help patients better understand what they’re looking at. The use of intraoral photography has made it possible for patients to truly feel like partners with the dentist in planning treatment that meets their needs, budget, and schedule. 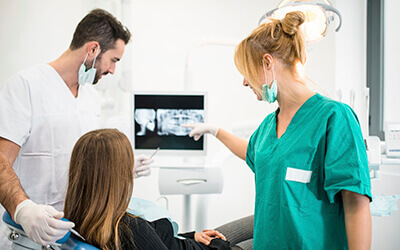 Digital radiography (x-rays) provide our dentists with high-definition images of the underlying structures of patients’ teeth. Traditional x-rays produced lower quality images and exposed patients to higher levels of radiation. Additionally, these x-rays had to be developed by hand, exposing our team to hazardous chemicals, the physical images had to be stored and transported, and traditional x-rays could only be viewed on a specialized light board. Digital x-rays are better quality images, allowing our team to more accurately diagnose oral health issues in earlier stages. These images are instantly available for viewing on our chairside computer monitors, and they can be transferred and stored conveniently in this digital format for quick, easy access. Traditional impressions required patients to bite down on a putty-like material that didn’t always taste the best. These impressions are still used, and offer effective results for dental labs who utilize impressions in the creation of restorations. Our practice uses the 3M digital impression scanner to capture precise, digital impressions of prepared teeth that are available instantly via computer for the dental lab. These impressions are more accurate, and dramatically reduce treatment time by allowing our lab to begin crafting restorations right away. 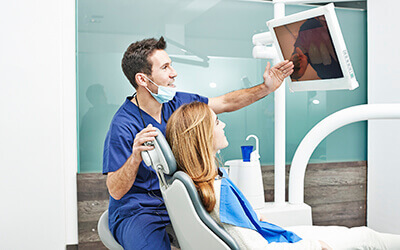 Many patients aren’t sure how cavity detection differs from x-rays or visual inspection which were previously used to detect cavities. The difference is in the advanced technology that allows us to prevent cavities not just discover and treat teeth that are already decayed. We use the DIAGNOdent laser cavity detection system. This dental laser measures the density of every tooth, allowing us to carefully monitor areas of weakness within the tooth enamel. These weaker areas are at increased risk for decay, and improved oral hygiene or use of professional toothpastes or mouth rinses may prevent decay.